We recently wrapped-up one of the largest E-rate efforts to date with a local school district. This 15-million-dollar effort included 130 miles of fiber and 75 locations connected via 1,880 terminations. This forklift connectivity project required a variety of equipment and a large contingent of manpower to accomplish, not to mention significant construction disruptions to the area. With such large-scale projects, property and landscaping damage can sometimes occur as a result of heavy machinery, equipment, and municipal layouts. It was our job to manage the project to make sure the disruption was as minimal as possible, and to make sure that we left the neighborhood in the same — or better — condition than we found it. One of the neighborhoods impacted by this project included a beloved elementary school and, specifically, the home of an older couple who have been long-time residents and active community supporters. In the fall of last year, the sidewalk in front of the couple’s home began to show signs of cracking. The weight of the directional boring used by the utility company as part of the project had compromised the cement, leaving it vulnerable to increased structural damage and deterioration from winter weather and general wear. NIS, in collaboration with the school district’s contractor, made the decision to replace ten, 4-foot panels of the sidewalk for the residents, and the neighborhood. NIS met with the affected neighbors, who had certain mobility restrictions, to determine the best course forward for replacing the sidewalk. After letting them know the work would be done to replace the concrete, the residents were happy to find the work crews friendly, polite, and professional. 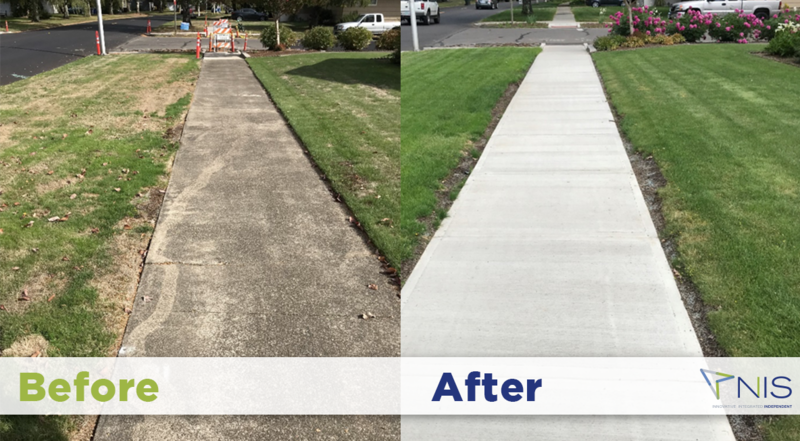 By mid-May, crews had completed repairing the sidewalk to its brand-new condition, and the neighbors couldn’t be happier with the results. As people active in their community, they enjoy and take pride in their home — having a safe, navigable sidewalk makes a huge difference in their quality of life, and that of the whole neighborhood. We’re always aware that our connectivity projects can mean major disruptions and inconvenience for the people and neighborhoods we serve, and we’re committed to making the impact of our work as minimal as possible. We also want to do our best to make up for some of those disruptions by going the extra mile for our neighbors, wherever we find them with attentive project management and responsible processes. Seeing the gracious couple, with a much safer sidewalk enjoying their front yard, makes the work we do worth it in the community. We’re proud to be part of this, and other initiatives like it that support connected schools, happy kids, and thriving neighborhood communities.